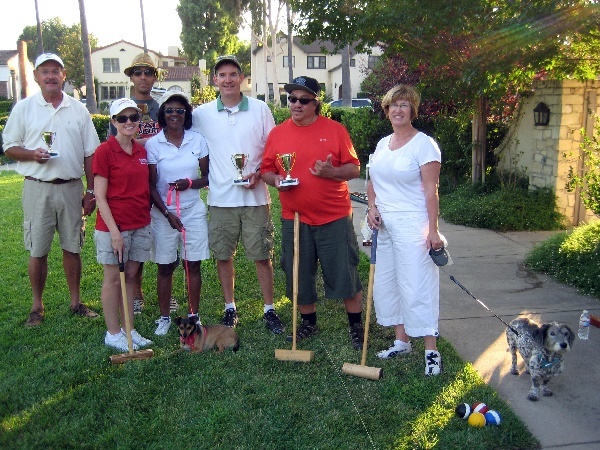 Another beautiful August afrernoon in San Marino brought out the best croquet competitors in the three year history of the San Marino Community Church 9 Wicket Tournament.This year six teams competed. Four were composed of the usual local croquet suspects, and some out of towners. Charles Foster from the Echo Park Croquet Club in Los Angeles, and Michael Rumbin carrying the colors of WoodRanch Croquet. Two additional teams of newer players who attend San Marino Community Church with the Mitchells juined in this year as well. They were the husband and wife teams of Jim and Julie, and Don and Karen. The event this year had a decidedly hi-lo flavor, as four of the teams had one experienced player coupled with a newer player. That resulted in a great balance of ability, with every team winning at least one game, and one game resulting in a tie even after one round of last balls. In fact, there was a shocking upset, as the newer team of Don and Karen team beat the more experienced team of Eric Sawyer and Mark Ferris +3. There was a bit of controversy after the unbalanced round robin preliminary games were played. Michael Rumbin and his partner Charles Foster advanced to the Finals with the best record of 2-0-1. The team of Laurie Mitchell and her sister Carson Bond (also known as the Bond girls) went 2-1-0 and had the second best record. However, since the schedule was unbalanced, and Laurie was the Tournament Director, she made her team ineligible for the Finals. An appeal was lodged because the other players felt Laurie and Carson had played better than the other teams and should advance, but the appeal was promptly denied by Chris Mitchell. That meant the team of Eric and Mark limped into the finals with an unimpressive record of 1-1-1. But because those two teams tied when they played in the preliminary round, it was believed that the finals would be close. The Final match was in fact close. It went back and forth, with some real sloppy play by both sides at first. Then some real canny croquet was played by Charles & Michael. In the end, they were up by two hoops in last balls. Eric had to hit a 8 foot wicket shot to score # 5, then hit a 15 foot roquet on real lumpy grass, then take-off 15 feet to set up in front of and score #6 to just tie the game. 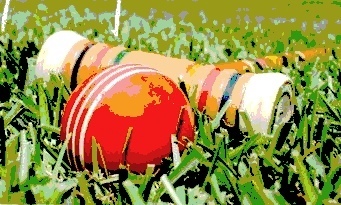 One round of last balls failed to settle the matter. In the second round of last balls, Charles and Michael had tough shots that they barely missed. Mark hit his ball near Eric’s near the turn-around peg, which gave Eric, with the last ball to play, an easy time scoring # 7 and the turn-around peg to win the match +2. The margin of victory was as narrow as a blade of grass. Caren Sawyer and her partner Cheryl Davis won third place in the consolation game. We’ll never know how Jim/Julie or Don/Karen would have finished, since they left after the preliminaries for dinner. Thanks to Pasadena Croquet Club member Laurie Mitchell for putting on another great event. Thanks also go to her sister, Carson Bond, for helping to put up the courts and equipment. Also, special thanks to Laurie’s husband, Chris, who has found his calling in life as a Tournament Referee; he resolved a few sticky issues that arose during the heat of croquet combat with aplomb. Finally, thanks to Laurie’s church for allowing us to play the event in the church’s garden, which is always one of the more festive croquet venues in SoCal. As always, the proceeds from this event go to the church’s charity of choice. Next year, there is talk of this event becoming part of the City of San Marino’s centennial celebration and perhaps being played in Lacy Park, where General Patton used to jump horses in his youth. Thanks again to the Mitchell Family for another great event. See you next year!